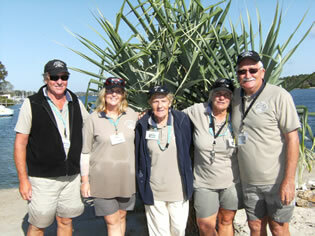 Every day of the year, a group of dedicated volunteers are on site to care for the dolphins and their visitors. Our aim is to provide all visitors with a unique and memorable wildlife experience as well as increase awareness of these beautiful mammals and the dangers they face. The knowledgeable volunteers answer questions from visitors, as well as make special presentations, (including to groups of school children) on the nature of the Australian Humpback dolphin, its habitat, behaviour, diet and threats to its environment. 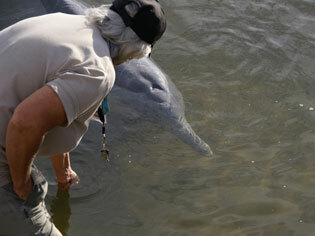 The volunteer groups expenses, including the purchase of fish to feed the dolphins and anti-bacterial wash to ensure that the health of the dolphins is not compromised by human contact with the fish, is funded from entry fee of $5 plus a $5 charge for each fish purchased to feed the dolphins. The volunteer group provides statistical information to the Environmental Protection Agency (EPA) including details of which dolphins come in, on what days, what time they arrive and the amount of fish they have been fed. Love the volunteers. Good info and very friendly. Very special. Thank you. Great talk... thanks for your time in explaining about the life of the dolphins. Wow you are all so amazing  the whole experience requires so much team work. You will never know how life changing this experience is to be able to interact with these wonderful dolphins. Keep up your good work. Its superb.